Noe Tanigawa is an arts and culture reporter for Hawaiʻi Public Radio. 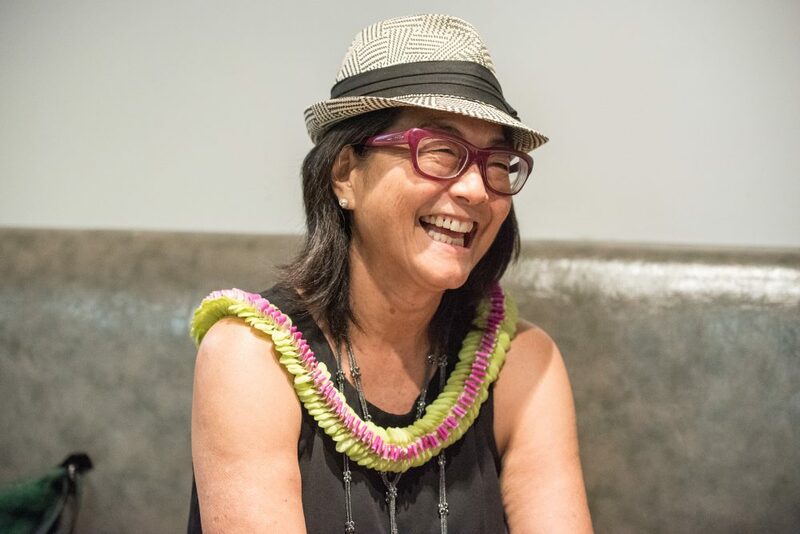 Before moderating a Zócalo/Daniel K. Inouye Institute “Pau Hana” panel discussion titled “Why Is the Mainland So Fascinated By Hawai‘i’s Food?” at Artistry Honolulu, she spoke in the green room about making omelets, her painting career, and inviting the Merrie Monarch to her dinner table. Where do you take mainland visitors in order to really show them real Hawaiʻi food? Where do they want to go, and where do you want to take them, because I imagine sometimes that where they think they’re going to find the most authentic food isn’t necessarily so. I know! There are so very few Hawaiʻian food places. The one really important nuance that needs to be made is, Hawaiʻian food, and food of Hawaiʻi. So to get Hawaiʻian food, there aren’t very many places, besides the classics: Helena’s, Highway Inn. How much have you dealt with food in your journalism? I’m an avid eater. I cook a lot—I used to make omelets at a place. Well, yeah, it was a friend’s booth at a farmer’s market, and he made omelets, with like eggs from his own chickens. And how [could I] mess that up? [Laughs] So I’ve had some experience with food. But Hawaiʻi food is, I mean, my [reporting] beat at Public Radio is art, culture, and ideas. So I look at the art scene as a whole, and I take the culinary arts in that. They get so much state support, and it really is one of Hawaiʻi’s most developed art forms. If you were having a dinner party for historic figures, who would you invite? It would be really fun to have a table of Hawaiʻians. I’d like to have a table with some people that I so respect. Could I ever have the “Merrie Monarch” himself [King David Kalākaua]? Then I’d like to move a little closer to the present. I’d like to have that incredible jazz pianist Richard Kauhi at my table. George Helm, another incredible musician—I’d have him at my table. Kui Lee is another great musician. All of these people are musicians, as well as party people. I really think that would be a great gathering. I’m an artist, I’m a painter, so that is my other career. I do encaustics and oils. I’ve got a lot of paintings up right now at Saks Fifth Avenue in Waikiki. I guess my dad’s. You know, those things get emblazoned, and this one is just so short and sweet: Practice makes perfect. Well, I cook, actually. Getting home from work, that’s the only thing to do, really, have some wine and then just settle into washing some vegetables, and then cutting them, and just dealing intimately. But I really don’t so-called “relax” much. I just do everything with the same intensity. I do go to the beach and read and swim and stuff. And I meditate. And I have my art practice. I just read Haruki Murakami’s IQ84. That was crazy! It kind of moved more smoothly between all the different worlds that he links, but it still was pretty crazy. It had a lot of nice sexuality, though. It’s like a four-dimensional picture that he puts together on a page.